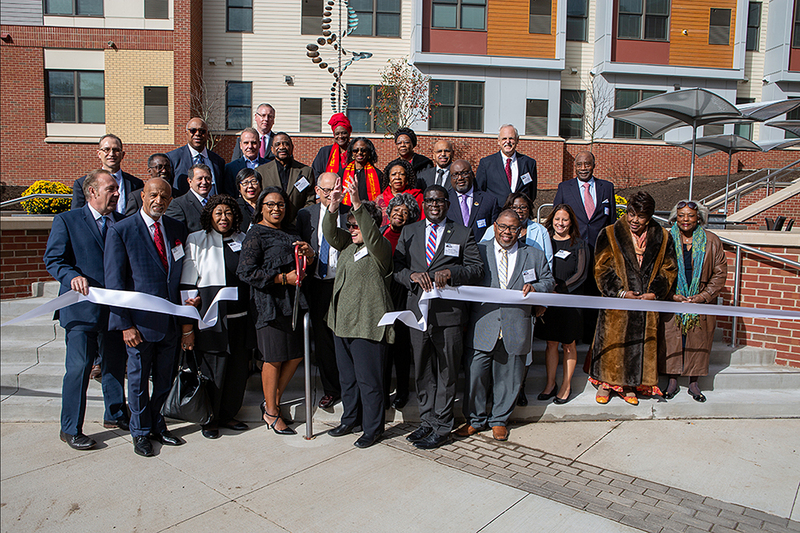 Rochester, NY On October 18th, DePaul, along with many state and local officials, celebrated the ribbon cutting of Upper Falls Square Apartments. The new 143,000 s/f, two-building, $31 milllion development brings quality affordable housing to the city’s Upper Falls neighborhood, while serving DePaul’s mission of improving people’s lives and their community ties by offering clean, safe homes, and an array of supportive services. It’s one of the largest single developments ever undertaken by DePaul. 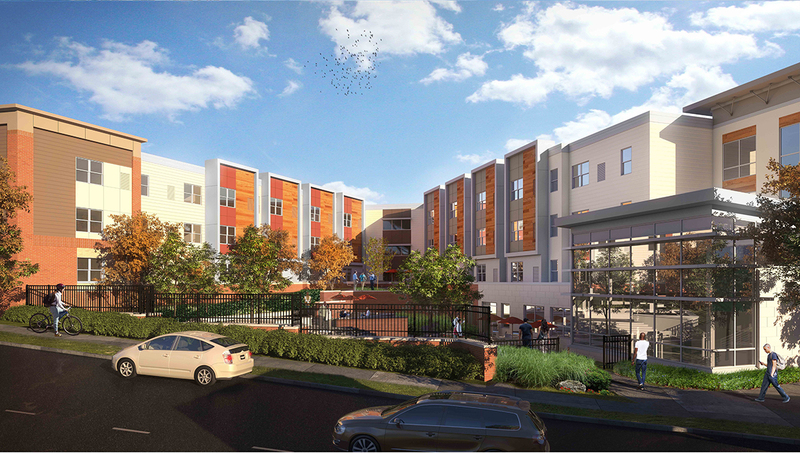 The project consists of two apartment buildings across from each other, creating 150 studio, one and two-bedroom affordable apartments for income qualified residents. 75 units include services to help individuals living with a mental health diagnosis. The ribbon cutting of Upper Falls Square Apartments. Building A, which contains 114 apartments, is named in honor of Ellen Stubbs. Stubbs, who passed away in 2012, was a nurse and deeply committed to her community, giving her time and talent to the Anthony L. Jordan Health Center, Community Health Care Association of NY, and other local organizations. Building B, containing 36 apartments, is named the Minister Raymond and Maxine Scott Apartments. 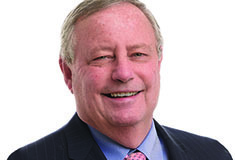 Minister Scott, along with his wife Maxine, has a decades-long commitment to bettering the community. Their involvement includes work with the Reynolds Street Church of Christ, Faith Temple, and the FIGHT organization, a network of community groups fighting for civil rights, founded in 1965. The mix of siding colors and stained-glass siding give the exterior great curb appeal. Each building has its own Community Room that not only has a private kitchen, but is visible from Cleveland St. at night with special lighting concepts that create a mix of colors displayed through the glass walls. Continuity of form and material lend an overall campus-like quality to the project without diminishing the individual presence of each building, echoing the way DePaul fosters individuality in its clients, while creating a sense of belonging to the community. Commercial Interior Construction: US Ceiling Corp.